MICHAEL SCHNEIDER, the honored founder of the city of Moweaqua, Shelby County, who is now living in retirement in this beautiful locality, is one of the early pioneers of Central Illinois, and his name is indissolubly linked with its rise and growth. His progressive public spirit and generous benefactions, bestowed with rare judgment and critical discernment as to the future needs of the community and the best way to promote its highest interest, have been instrumental in pushing forward various enterprises that have been of great benefit to this section of the State. On the banks of the beautiful river Rhine, in Germany, our subject was born in September, 1813. His father, who bore the same name as himself, was born in the same Rhenish province, and was there reared on a farm. He married Mary Bauer, who was a native of that part of Germany, and died there in 1820. In 1824, the father of our subject resolved to emigrate to America, where he hoped to better his condition. He came to this country accompanied by five of his seven children and first settled at Bethlehem, Pa. In 1827 he removed to Ohio, and for a time resided near Cincinnati. He subsequently identified himself with the pioneers of Brown County, in the same State, and on the farm that he bought there passed the remainder of his life. Michael Schneider, of whom these lines are written, was a lad of eleven years when his father came to this country, and he and a sister were at that time left in charge of an uncle, but two years later the father sent for them, and they set sail from Hamburg in May, 1826, landing at New York eighty days later. Our subject went to Ohio with his father, and for a time lived with him near Cincinnati, which was then only a good-sized village. He was a strong, self-reliant, manly boy, and at once commenced to earn his own living, finding employment with Andrew Heredes, with whom he remained some years, and in 1833 he came with him to Illinois, making the journey hither over those great highways of pioneer travel, the Ohio and Mississippi Rivers. He located with his employer on Lick Creek, in Sangamon County, and there Mr. Heredes erected one of the first steam grist mills ever operated in the State. In 1835 Mr. Schneider borrowed $50 of Esq. Campbell, and entered forty acres of Government land in what is now Christian County, his purchase adjoining the present site of Moweaqua. He bought the claim of Mrs. Denton, and five acres of it were cleared, and a log house stood on the place. There were no railways here for many years after he settled on his land in 1837, and he had to draw all his grain to St. Louis with ox-teams, where he sold it for thirty-seven and a half cents a bushel, and his hogs only brought him $1.25 to $1.50 a hundred pounds. Deer were plentiful, and with prairie chickens and wild turkeys, formed a welcome addition to the fare of the pioneers. Mr. Schneider worked early and late in the upbuilding of his new home, being greatly assisted by the active co-operation of his wife, and he prospered exceedingly in his efforts to secure a competency. He invested his money judiciously, continually entering and buying other land near his original purchase until he had two thousand acres, all told, of land of surpassing fertility. This included the land upon which the thriving city of Moweaqua now stands. Attracted by the unrivalled beauty of the spot, and the natural advantages for the site of a town, our subject determined to plat the land, and afterward carried out his plans, which have given to this county one of its brightest ornaments, one of "the prettiest villages of the State," to quote from an enthusiastic admirer, and here center many lovely homes and happy firesides in dwellings of a modern and attractive style of architecture. Its people are cultured, thrifty, prosperous and enterprising; its church privileges and educational advantages are exceptional; its varied industries and business enterprises are ably conducted under sound financial methods. One attraction of the city. though it may be a negative one, is eminently worthy of mention, and that is the fact that there have been no saloons for the sale of liquor here for years, which speaks well for the temperance and sobriety of the citizens. 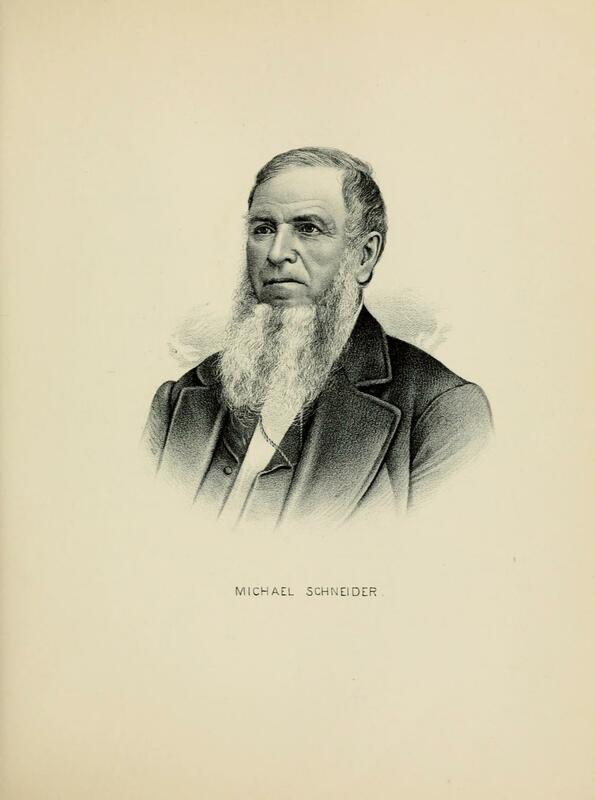 In 1882 Mr. Schneider removed from Moweaqua, and has since lived retired from active business. He has always taken a deep interest in all that concerns this city, which owes its origin to him, and no man has done more to established it on a solid basis of enduring prosperity than he, or has been more influential in raising its moral and religious status. All schemes to add to its beauty have met with his hearty approval, and his generous gift of land for a public park in 1882 has greatly increased the attractiveness of the place. He encouraged the building of the railway through here by a liberal donation of land and lots, and to Mr. Eastman he gave land on condition that he would built a mill within the corporation limits of the city. The blessings of a happy married life have been vouchsafed to our subject, as by his marriage in October, 1833, with Miss Margaret Kantz he secured a true and loving wife, and they have lived in peace and harmony for nearly fifty-seven years. They have reared these seven children to honorable and useful lives, — Michael, Christopher, Margaret, William, Valentine, Adam and Caroline. Mrs. Schneider was bom in Baden, Germany, March 21, 1811, and is a daughter of Christopher and Caroline (Lichtenberger) Kantz, who were also natives of Baden. Her father spent his entire life there, while her mother came to America in the latter part of her life and died in Brown County, Ohio. 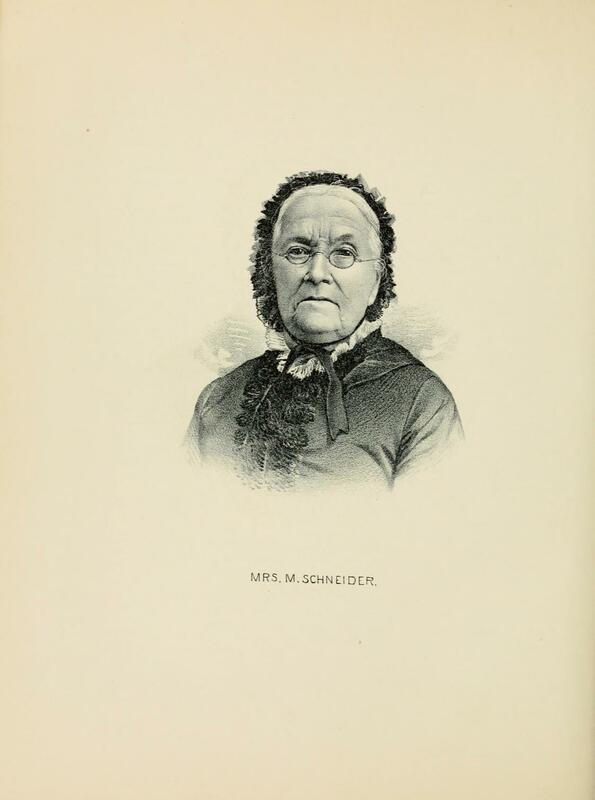 Mr. and Mrs. Schneider are people of earnest religious convictions, who lead exemplary Christian lives. Their parents were members of the Lutheran Church, and they were reared in that faith, but early in their married life they united with the Methodist Episcopal Church, and for more than half a century have been consistent and devoted in their membership with that church, and have borne a prominent part in its upbuilding in this section of the country. In their early life here when they lived in a log cabin, their humble abode was always open to preachers of all denominations, and meetings were frequently held within its walls. They contributed liberally of their means towards the erection of the present house of worship of the Methodists, and are generous in their support of the Gospel. On another page of this volume the lithographic portraits of Mr. and .Mrs. Schneider are presented, and it is a pleasure to thus perpetuate the lineaments of this worthy couple. Extracted 07 Apr 2017 by Norma Hass from 1891 Portrait and Biographical Record of Shelby and Moultrie Counties Illinois, pages 223-228.